Gouache on paper, 21 x 14 inches (sight), 29 ¾ x 22 ¾ inches (frame). Unsigned, estate stamp verso. This work was acquired from An heir of one of Lehman’s relatives who lived and worked in the Greater New York City area. 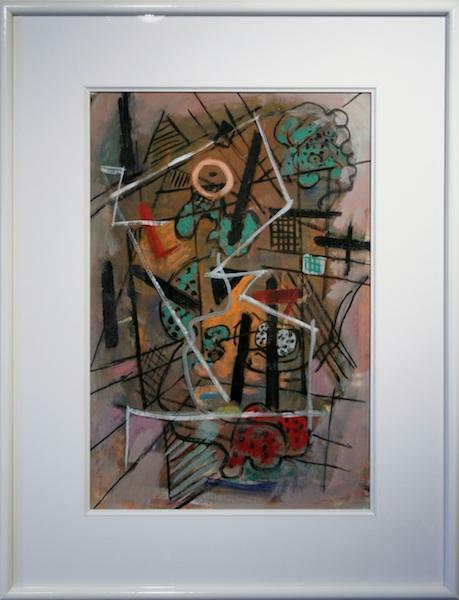 One of Lehman’s best abstract renderings which combines his formative Russian years of constructivist influence, prior to arriving in the U. S., with his newly found modernist semi nonobjective style after establishing residency in New York City. The work depicts a linear likely dancing female juxtaposed over a cacophony of park like trees, wires and telephone poles probably derived from the artist’s Greenwich Village or Brooklyn neighborhoods between his years as a “New Deal” artist and his work at the Brooklyn Navy Yard during World War II. More biographical information available on request.